The Cultural Exchange International Fellowships awarded through the Department of Cultural Affairs of the Municipality of Los Angeles (restricted to artists living in Los Angeles County in the USA). We may announce deadlines for additional restricted selection processes as we continue to develop strategic alliances and partnerships. All deadlines are announced here in our newsletter as well as at www.sacatar.org under APPLICATION. You can read about the experiences of these most recent Fellows in their own words by clicking on their names. Here is a brief summary of what the last group of Fellows did. Working with local dancers and technical crew, Amy wrote, choreographed, danced in and directed a dance film in which she conjoined the stories and dances of the orixáswith breakdancing. Filming took place across the island of Itaparica and on locations in Salvador. In addition to writing new works based on the movement and rhythm of Brazilian music and dance, Cristina worked with a local translator to translate one of her books from Spanish into Portuguese. She also gave several readings of her work and presented creative writing workshops, including one with thirty students from the Jutahy Magalhães School, adjacent to Sacatar. She also gave an interview to our local radio station, Rádio Tupinambá. Ernesto worked on a low-cost computerized electronic percussion orchestra controlled by a single musician and capable of performing at a rate impossible for human hands. Justin designed new ‘Fantastic Creatures’ for future performances, inspired by the local culture and particularly by the orixás, which are the deities of the candomblé tradition, and by the eguns, the incarnated spirits of ancestors through a religious tradition out of west Africa which is uniquely practiced in Brazil on the island of Itaparica. 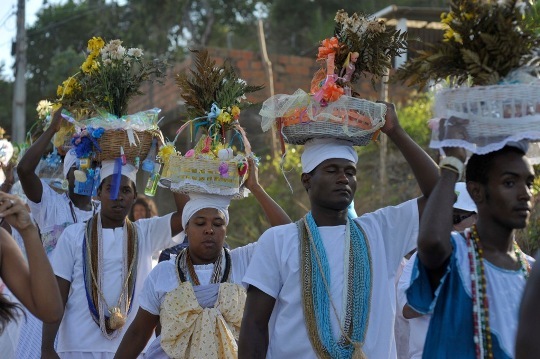 As part of his research, he visited terreiros where these religious ceremonies take place and took classes in the percussion and dances of the orixás. Matt developed video animations from paintings he had produced prior to his arrival in Bahia. He also did video installations, often on extremely short notice, at the Library and Cultural Center of Itaparica, in the colonial neighborhood of Salvador known as the Pelourinho and in the historic city of Cachoeira through an invitation from the Federal University of the Recôncavo. Matt came to Sacatar through our partnership with the Los Angeles Department of Cultural Affairs. Maya finalized work on a three-screen video installation featuring sacred texts taken from the Torah, Bible and Quran and spoken in their original languages (with subtitles!) Ernesto collaborated closely with her on the sound design. Later in her residency she began a new work, inspired by her stay in Itaparica. On the last Friday of their residency, the Fellows opened the doors of their studios and shared their work with about fifty members of the local community. Please come! The next Visio salon will be held on the afternoon of Thursday, February 28, at the Museu de Arte Moderna da Bahia in Salvador. 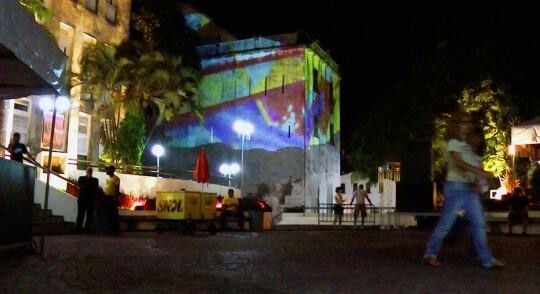 Although their residencies at Sacatar ended in December 2012, Ernesto and Maya continue to collaborate. They will conduct workshops in audio and video arts for 69 children in Peru in February 2013. They will also continue to refine the video Maya edited during her residency, creating a three channel soundtrack for the three screens of the video. Matt and Amy plan to apply to secure funds for a performance collaboration at the REDCAT Theater in Los Angeles, USA. Amy has begun to edit her video footage and Ernesto is working with Amy on the soundtrack for the film. What is amazing is that these artists all met each other for the first time at Sacatar. We are pleased to continue our partnership with the Municipality of Los Angeles’ Department of Cultural Affairs. To date, the Cultural Exchange International program has co-sponsored five Sacatar Fellowships for artists living in Los Angeles County. In 2012 Sacatar received 47 applications from Los Angeles County artists. Sacatar advanced the applications of eight artists to the Department of Cultural Affairs, which will announce the recipient(s) of one or two Fellowships in February 2013. Anani Sanouvi, a dancer/choreographer from Togo, currently living in the Netherlands. Tendai and Anani will be the fifth and sixth artists to receive Sacatar Fellowships through our partnership with Africa Centre. Nerize Portela, a video-artist from the Brazilian state of Minas Gerais. Our congratulations to these future Fellows! have all succumbed to saudades and have returned or are planning to return to Bahia very shortly. Click on the Fellows’ names above to go to their ALUMNI pages. In November RIK FREEMAN returned to inaugurate the mural he created as a gift to the library and cultural center of Itaparica. 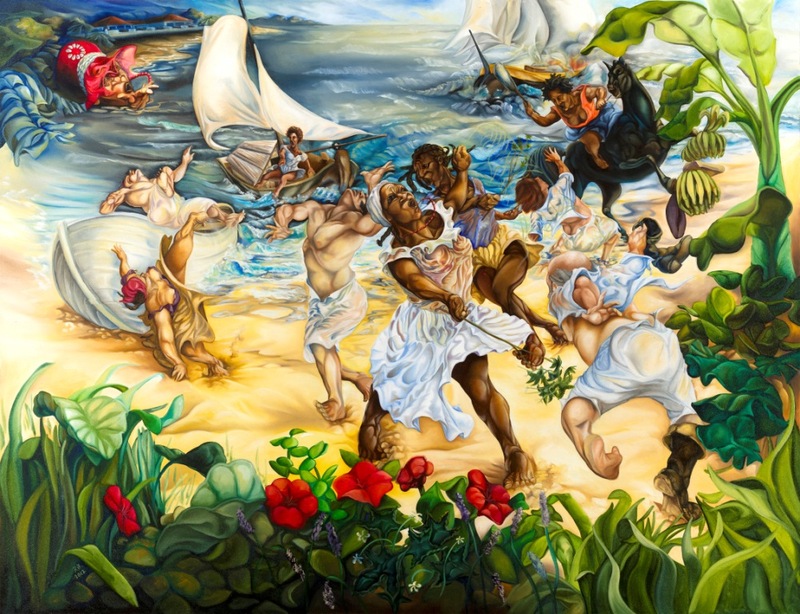 The mural depicts the moment when local heroine Maria Felipa drives away the Portuguese soldiers, beating them with a particularly vicious local variety of poison ivy. During his too brief stay, he also painted a mural on the wall of Amigos, a favorite restaurant of the Sacatar Fellows. 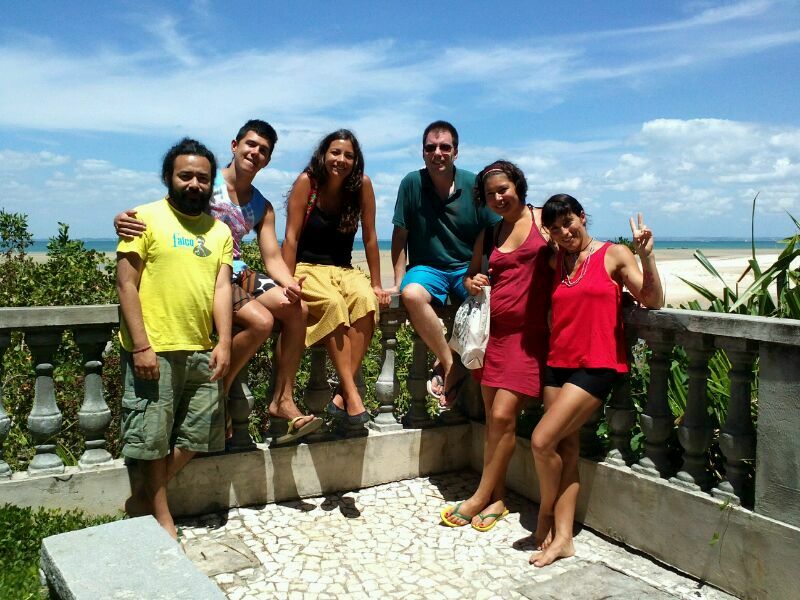 SCOTT BARTON returned to Bahia in January and will stay all year in order to conduct research for his doctoral thesis on the food of the African diaspora within candomblé. JANE COFFEY returned to participate in the various celebrations in honor of Yemanjá, the orixá of the ocean. Every year on February 2, several hundred thousand people converge on the beach in the Rio Vermelho neighborhood of Salvador to offer gifts to the Queen of the Sea. In a lesser known festival on the same day, the eguns — the incarnated ancestors — offer gifts to Yemanjá from Ponta de Areia, a neighborhood just down the beach from Sacatar. On the following day, February 3, the living of Itaparica send their gifts out in boats from Amoreira, also just down the beach from Sacatar. Jane came to attend all three ceremonies as research for a novel that nears completion. DIANA BLOK was also here in Itaparica during the Yemanjá festivals. The first photograph in this issue of the Jornal Sacatar was taken by Diana at the Festa de Yemanjá in Ponta de Areia, Itaparica, Bahia, on 2 February 2013. ARIEL DE BIGAULT is spending a month in Bahia teaching a course on video production to the students at the TV Pelourinho, a frequent collaborator of the Instituto Sacatar. 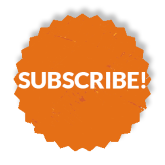 You can read what SOLANGE LIMA will be up to under NEWS OF FELLOWS later in this newsletter. The Tia Ciata Trophy is awarded annually to individuals and organizations that make a significant contribution to the local arts and culture. This year Sacatar was honored to be among the recipients. The sambista Alaor Macedo awarded the trophy at a ceremony held at the marina of Itaparica in November 2012. The trophy acknowledges the founding director Taylor Van Horne (curiously spelled Tailor Van Horn) and the Instituto Sacatar. Here is an incomplete sampling of the extraordinary diversity of work currently produced by former Sacatar Fellows, some of which was developed during their residencies. We regret we can’t publish everything we receive from former Fellows, but we love to know what you all are up to, so please stay in touch! To see our former Fellows’ ALUMNI pages, just click on their names. DAMIEN SCHUMANN (South Africa, 2011) After Damien’s return to the USA / Mexico border to further document Cuidad Juarez, the ‘Nuestra Casa Initiative’ was exhibited last year at the Centennial Museum of the University of Texas, El Paso, USA. The NCI exhibition will move to Las Vegas in 2013. Damien thanks Project Concern International and UTEP for their efforts in making this project such a success. An ongoing project in 2013 addresses food security by following the culture of eating meat in the informal townships surrounding Cape Town. As part of this study, Damien is collaborating with a pathology lab to document the internal effects of our actions. DANNY GWIRTZMAN (USA, 2003) The Daniel Gwirtzman Dance Company — an ITE 2012-13 Space Grant Winner — will present a showcase of new choreography at the Red Bean Studios on West 37th Street, New York, NY, USA, on Sunday, 17 February at 18,00h. After the showing there will be a wine reception and an opportunity to meet and interact with the dancers. Danny will return to Sacatar in May for a second residency, ten years after his first. Ten years ago we had not yet built the five additional studios, including the dance studio, so he will see some big changes. DEREK BERMEL (USA, 2007) has released a CD of recently recorded compositions, entitled ‘Canzonas Americanas’ and featuring the Brazilian vocalist Luciana Costa performing ‘Itaparica,’ which she had premiered with the Los Angeles Philharmonic Orchestra in 2010. Available at amazon.com as a CD or i-tunes. EJ LEVY (USA, 2006) Her recently published collection of short stories, ‘Love, In Theory,’ is the winner of the Flannery O’Connor Award, just got a Starred Review in Kirkus and is nominated for a number of awards, including a Pulitzer and the National Book Award. ‘Love, In Theory’ is one of two books that EJ worked on at Sacatar. 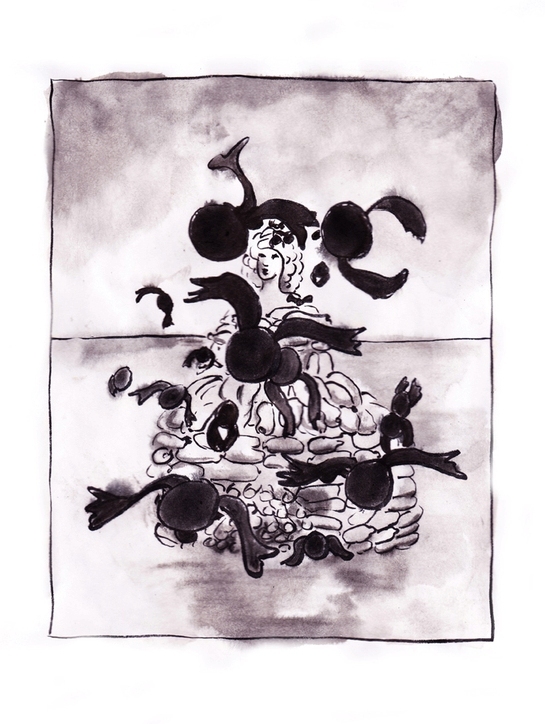 ETIENNE YVERS (France, 2009) exhibits ‘Faits d’Yver’ through 9 February 2013 at the Point Rouge Gallery, 4 rue du Dahomey, 75011 Paris, France. FRENCH–MOTTERSHEAD (UK, 2008) Rebecca and Andrew have a new installation ’10 Acts’, launched 11 January in Brighton, England. It’s a series of photographs in light-boxes they’ve made with local people that explore how personal moments help make public space. The work has been made especially for the city’s Jubilee Square. The installation will be in place through 10 March 2013. JAAKKO HEIKKILA (Finland, 2008) has an exhibition of his large format photography at the Galerie Ruth Leuchter in Dusseldorf, Germany, through 2 March 2013. 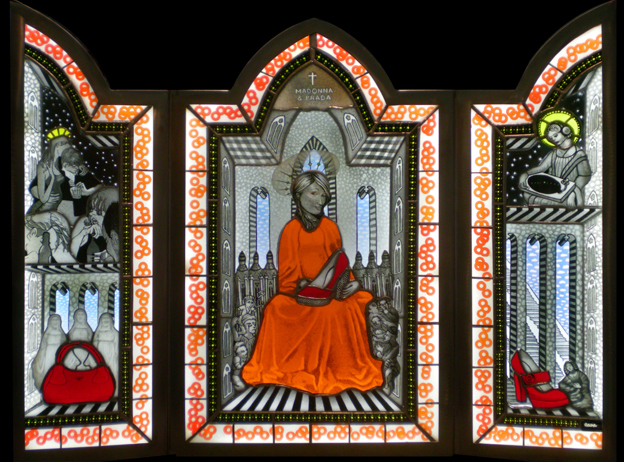 JOSEPH CAVALIERI (USA, 2011): The Museum of Arts & Design in New York, USA, has purchased his stained-glass triptych, ‘Madonna & Prada: A Day in the Life of Madonna,’ for its permanent collection. LAURA ANDEL (Argentina>USA, 2004) performed New Music Explorations in collaboration with Daniel Binelli (bandoneon), Elliott Sharp (guitar), Carl Maguire (Fender Rhodes), Andrew Drury (percussion) on Saturday, 2 February, 2013, presented by ROULETTE CONCERT SERIES, 509 Atlantic Avenue, Brooklyn, New York, USA. RITA STASHULIONAK (Belarus>Poland, 2011) exhibited ‘Rendezvous z Miastem’ at the Galeria Spatium Nowum in Elblag, Poland, through the end of January 2013.